The intersection of technology and medicine can be a pretty confusing place for providers and patients alike. But that’s where telehealth and telemedicine sit. For those who aren’t intimately familiar with the medical and technical terms that are tossed about, discussions related to the use of remote audio and video technology for healthcare can feel like a swim in alphabet soup. 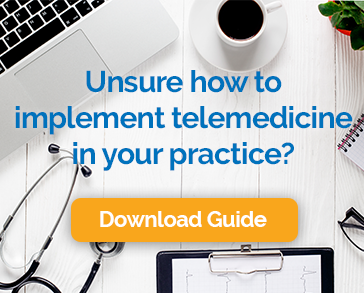 That’s why we’ve compiled this list of common telehealth related terms that are important for providers, office staff, and patients to understand. Feel free to share it with anyone who might benefit from this introduction to the language of telemedicine. Telemedicine: Telemedicine is a subset of telehealth that is related specifically to the provision of clinical healthcare services and education remotely, through the use of telecommunications technology. Telemedicine is often used for primary care, the management of chronic conditions, medication management, specialty care, mental health services, and other clinical care that can be provided effectively using secure video and audio connections. Telemedicine and telehealth are often used interchangeably, but there is a distinction. API (Application Programming Interface): An API is software that allows two different applications to send data back and forth. For example, your telemedicine software may have an API that allows it to connect to your practice management software, eliminating the need to enter data in multiple systems. Asynchronous: In relation to telehealth, asynchronous is a term used to describe the transmission of medical images or data that does not happen in real-time. For example, if you call someone and leave a voice mail that they will listen to later, that is a form of asynchronous communication. Whereas, if you call and speak to them on the phone, you are engaging in synchronous communication. This is an important distinction in telehealth because many insurance providers do not provide reimbursement for asynchronous (also known as Store and Forward) encounters. Business Associate: Under the HIPAA guidelines, a business associate is an entity or a person that performs activities on behalf of a covered entity (the provider). Transcription services, attorneys, and accountants are all examples of Business Associates. Technology vendors that provide video conferencing services are also considered Business Associates. In most cases, HIPAA requires that the provider and business associate sign an agreement to ensure that all protected health information is treated with the same precautions by parties. Endpoint: A terminal used to make or receive a video conferencing call. Calls originate and terminate at endpoints. In telemedicine, the provider’s laptop and the patient’s mobile device may be endpoints. Hub Site/Spoke Site: Medicare and Medicaid use a Hub/Spoke model to define the conditions under which telemedicine can be reimbursed. The location of the patient is considered to be the “spoke” or originating site, while the distant provider is located at the hub site. Spoke sites are generally limited to medical office buildings and the presence of a provider is usually required. m-Health (Mobile Health): The practice of medicine and public health supported by mobile communication devices, such as mobile phones, tablets, and PDAs. Medicare Chronic Care Management (CCM): The Medicare Chronic Care Management program, which was enacted in 2015, gives private practices the ability to bill Medicare for remote follow-up visits with patients suffering from two or more chronic conditions. Peer-to-Peer Networking: This is a special type of internet connection that hides the identities and locations of all participants. Peer-to-peer networking reduces the chance of accidental or intentional unauthorized access to information contained in the communication. It is used in telehealth to protect patient health information. Telematics: The use of information processing based on a computer in telecommunications and the use of telecommunications to permit computers to transfer programs and data to one another. Telemonitoring: Telemonitoring is the use of audio, video, wearable devices and other electronic information sharing technologies and devices to monitor the health of a patient remotely. Telemonitoring can be used to get information about a patient’s activity level, vital signs, or blood sugar levels for example. Telepresence: Telepresence refers to a set of technologies which allow a person to feel as if they were present at a place other than their actual location. In some cases, users may even have the ability to affect the remote location. In this case, the user’s position, movements, actions, voice, etc. may be sensed, transmitted and duplicated in the remote location to bring about this effect.